This product makes it easier for you to keep your bowels healthy. It has a three pronged approach to help you do this. A very soluble but gentle fibre that helps to improve transit time for both loose and constipated systems, along with pre and probiotics to help to keep the environment within the bowels nice and clean. LEPICOL is made of natural source ingredients which help to maintain the efficient action of the bowels, Taken daily, it will safeguard your fibre intake to help ensure regular bowel movements, whilst at the same time provide the friendly bacteria important to maintain a healthy balance. 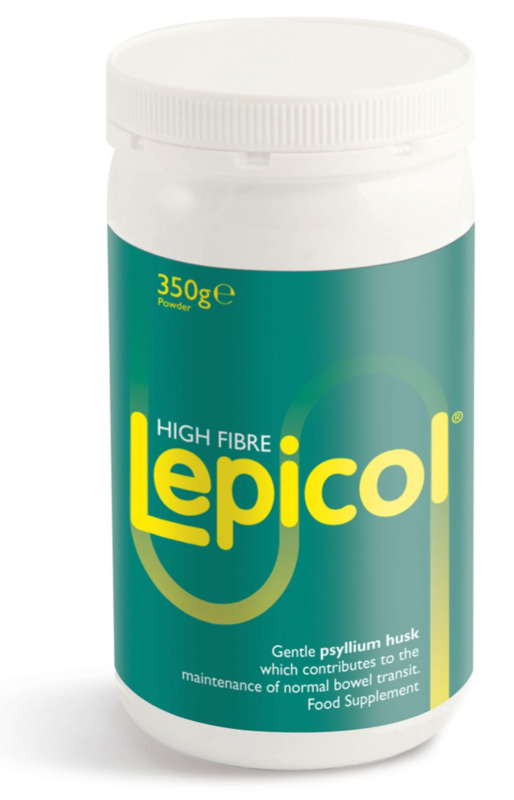 Lepicol is a multi-fibre source product containing gentle psyllium husk known to maintain normal bowel transit, as well as inulin which is a prebiotic fibre source. Together, these two ingredients go a long way to help provide your recommended daily intake of fibre - something that many of us lack with the modern diet. The third key ingredient of Lepicol are 5 probiotic strains. These beneficial bacteria help to balance the microflora in your digestive tract, supporting in the health of your bowel. ~ Maintaining a healthy, regular bowel. ~ Detox (LEPICOL, because of its cleansing properties, is ideal for inclusion in a Detox diet). PSYLLIUM HUSKS, which come from the cleansing plantain Psyllium, are rich in fibre and able to absorb more than 20 times their own weight in fluid, ideal to help in the movement of waste through the digestive system. The psyllium used in Lepicol is 98% pure and is the highest grade available. INULIN (PREBIOTICS) are extracted from Chicory and have been shown to extend the life of Lactobacillus bacteria. Recent research in Japan and the USA has shown how Inulin can sustain intestinal flora and enhance the Bifidobacteria population. PROBIOTICS, Known as the friendly bacteria are vital to a healthy colon. The inclusion of healthy bacteria in Lepicol plays an important part of the overall program in keeping the colon healthy. Psyllium husks (Plantago ovata forsk), Inulin, Probiotics. 600 million CFU/5g dose (6.0 x 108 CFU/5g. Allergen advice: Lepicol contains traces of soya and traces of milk at a level which would not affect lactose intolerant sufferers.Store out of the reach of young children. LEPICOL is FREE from wheat, FREE from sugar, FREE from additives. Contains traces of milk and soya at a level which would not affect lactose intolerance sufferers. For best results, take Lepicol at least 30 minutes away from food. Adults: Take 1-2 (5 -10g) heaped teaspoons mixed with a glass of water or juice once or twice daily and consume immediately. This should then be followed by a further glass of water. Children: 0.5-1 (2.5-5g) heaped teaspoon mixed with a glass of water or juice once or twice daily and consume immediately. Parents should seek the guidance of a medical practitioner before giving Lepicol to children under 11 years. After two weeks, for some people, the amount of Lepicol taken daily can be reduced. Please note: Taking Lepicol without water can cause choking. Always aim to consume 200-250ml of liquid with every 5g (heaped teaspoon). Please consult your doctor before taking Lepicol if you have recently had intestinal surgery or you have an intestinal obstruction. If at any time you experience discomfort after taking Lepicol, stop taking and seek medical advice.